Only two artists have earned a PEGOT—by winning a Pulitzer, Emmy, Grammy, Oscar, and Tony. Comedy writers Dave Barry and Alan Zweibel are not those men (it was Richard Rodgers and Marvin Hamlisch). But Barry and Zweibel think they can fool the PEGOT gods by joining forces. Barry received the 1988 Pulitzer Prize for Commentary for his Miami Herald humor column, which was syndicated in more than 500 newspapers worldwide. Zweibel, one of the original Saturday Night Live writers, has several Emmy Awards for his television work and collaborated with Billy Crystal on the Tony Award-winning play 700 Sundays. Together Barry and Zweibel are still a G and an O short of a PEGOT. Keep trying, guys. In the meantime, they’ve cowritten a comic novel starring two ordinary New Jersey dads who hate each other with a boiling rage. In Lunatics, when mild-mannered Philip Horkman calls offside on acerbic Jeffrey Peckerman’s daughter in the local kids’ soccer league championships, their personal feud escalates into an international news story involving a kidnapped lemur, a secret terrorist cell, Cuban revolutionaries, and vacationers on a clothing-optional cruise. 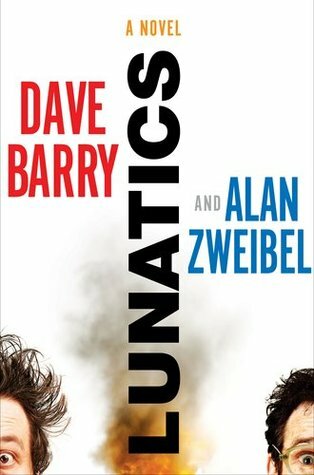 Barry and Zweibel took time off from polishing their awards to chat with Goodreads about pushing the limits of comedy. Goodreads: Lunatics is told from both Philip’s and Jeffrey’s points of view in alternating chapters. Did one of you write Philip and the other Jeffrey, or did you both work on both characters? Dave Barry: Alan wrote Philip, and I wrote Jeffrey. Also large sections of the book were written by J.K. Rowling, Stephen King, and the Twilight woman. But that part is confidential, so please don’t print it. Alan Zweibel: It was like corresponding with a deranged pen pal. I’d write a chapter as Philip and then e-mail it to Dave, who would then send me an outrageous Jeffrey chapter a few days later that always surprised me he was allowed to vote.